There’s only one thing that beats pizza at PizzaExpress and that’s PizzaExpress pizza in the sunshine! It’s officially summer and time to make the most of those lighter evenings and longer days. We can’t think of a better way to do this than by getting together with family and friends and trying out the brand new summer menu at PizzaExpress. As always, there’s something for everyone. 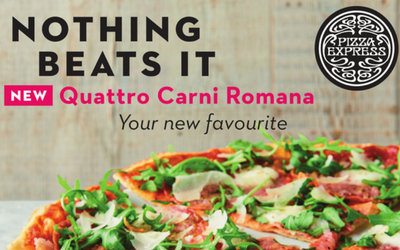 The bigger, thinner & crispier Quattro Carni Romana has just been introduced, as has a new Vegan Leggera, plus some returning Summer favourites. There’s also a new addition to the Piccolo set menu, a Pip Rainbow frozen lolly! Watching the calories? No problem. Try the lighter Vegan Leggera Giardiniera – just under 600 calories! Of course if you’re in the mood for a real treat, there’s a classic Affogato, a mouth-wateringly delicious combination of a strong espresso and creamy gelato. Mmmm. There’s no time to waste. Gather your nearest and dearest and head on down to the Broad Street Plaza PizzaExpress and experience the flavours of summer.